It seems wrong to cut down a tree for any reason in the concrete jungle but we had a fir tree in the backyard that was leaning, with dead branches and was smack in the middle of the yard. Our neighbor did not like it either so he offered to lend us his chain saw. The first step was cutting the top off. We won’t go into details on this part, just know that it involved a ladder, a chain saw, and some rope (to make sure the top fell where we wanted it to) and a bit of luck. We cut off the top of the tree leaving about 8 feet of the trunk so we could pull it out later. This left us with a bunch of large tree branches that we now had to deal with. Enter, NYC and its new organics recycling program. Thanks to the new program, we were able to cut up the branches and separate them into tied bundles and then set them out on the curb (a few at a time) to be picked up by the city. We also received two new brown bins where we could put all our garden clippings, leaves and sticks for the program to recycle. Brilliant. Oh and in case you were wondering, you can’t burn fir tree wood in your fireplace because it has too high a moisture content. If you were cutting down a tree whose wood you could burn, you would have to let it dry out for a significant period of time before you could burn it in a fireplace. You cannot burn wood in a fire pit in your backyard–despite what our neighbor says. Now, for the trunk. One day, our other neighbor had gardeners in her yard so we asked them how much to remove the trunk and roots. He told us $300 not including taking the stump away. That was not in our budget. 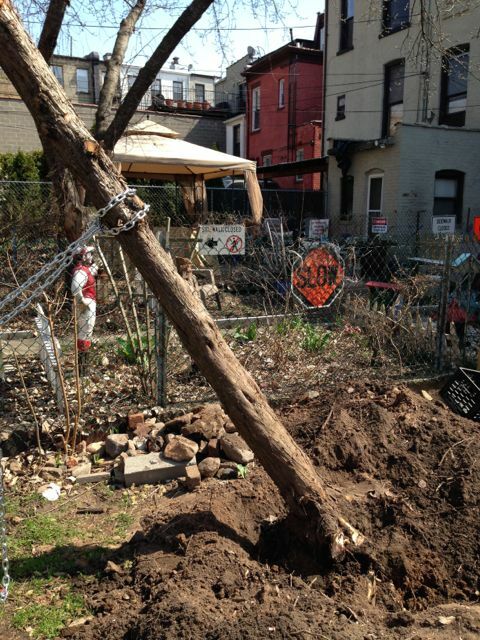 In our previous apartment, we had watched a tree stump being removed and they used a large truck and some chains. We could not use this method because our backyard butts up to private property all around. Because we are cheap and always up for a challenge, we purchased a 2 ton cable winch from Harbor Freight for 20 bucks and some chain. The winch works by attaching a chain around the stump and another around a solid object (in this case our other much larger tree) then you crack away on the winch and watch it pull the tree down. We had to tighten up the chains several times (as the winch only provides about 6 feet of cable) and dig around the root system a bunch but we got the tree down. After the tree was down we cut up the trunk with the chainsaw and wrapped the chains around he stump and cranked more until all of the roots were out. In the end we had just this big hole in the ground but no worries because the contractor left us a giant mound of dirt when the extension was created. 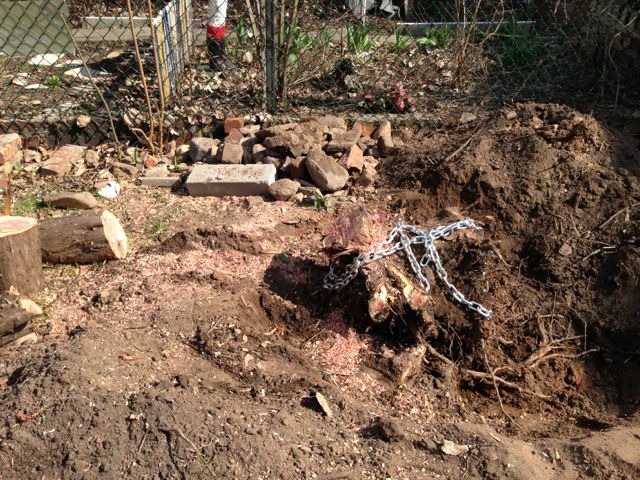 Afterwards, there was some more digging and cutting with an axe to get out the roots out but we are now stump-free.